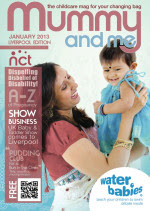 Downs Side Up feature for the first time in exciting parenting publication My Mummy and Me Magazine this month. Check out our 3-page article on pages 24, 25 and 26, available as a free online download or a paper copy in the Liverpool area. We talk about what to say when a baby is born with Down's Sydrome and chat openly about our feelings at that time of transition for us. See the other articles I have written to dispel myths and gently change perceptions from within hearts in our Published Articles Page.